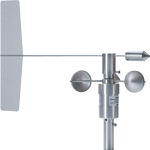 The 03002, manufactured by R. M. Young, measures wind speed and direction with a three-cup anemometer and a wind vane mounted on a small crossarm. It interfaces directly with your Campbell Scientific data loggers, so no signal conditioning is required. The 03002 uses a cup wheel assembly to measure wind speed. Rotation of the cup wheel produces an ac sine wave that is directly proportional to wind speed. The frequency of the ac signal is measured by a data logger pulse count channel, then converted to engineering units (mph, m/s, knots). Campbell Scientific’s version uses shielded bearings, which lowers the anemometer’s threshold. Wind direction is sensed by a potentiometer. With the precision excitation voltage from the data logger applied to the potentiometer element, the output signal is an analog voltage that is directly proportional to the azimuth angle of the wind direction. Rated 1 W at 40°C, 0 W at 125°C. The 03002 is supplied with a 12-in.-long x 1-in. IPS unthreaded aluminum pipe, which mounts to a crossarm via a CM220 Mount or 17953 Nu-Rail fitting. The 03002 can also be mounted to the top of a CM106B or stainless-steel tripod via the CM216. 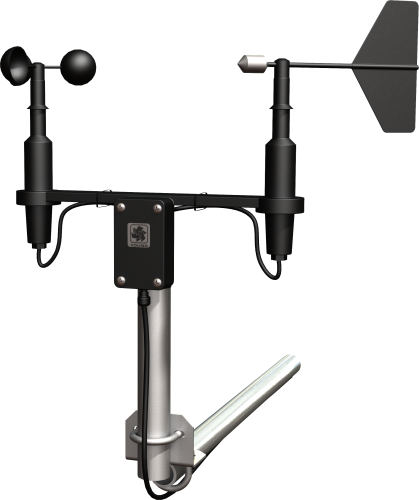 The anemometer is measured by the PulseCount instruction in CRBasic, and by Instruction 3 (Pulse Count) in Edlog. The wind vane is measured by the BrHalf Instruction in CRBasic, and by Instruction 4 (Excite-Delay-SE) in Edlog. The measurements are typically processed for output with the Wind Vector Instruction (not present in the CR500 or CR9000). Is it possible to replace only the wind sentry vane of a 03002-L? If so, is it user replaceable? It is possible, but Campbell Scientific does not recommend user replacement. Factory replacement is strongly recommended. What crossarm and mounting hardware should be used to mount the 03002-L to a universal met tower? A CM202, CM204, or CM206 crossarm can be used. Select the appropriate crossarm for the application. To mount the sensor to the crossarm, use a CM220 (Right-Angle Mounting Bracket) or a 17953 (1- x 1-inch NU-RAIL Crossover Fitting). To mount the sensor to the top of a CM110-series tripod, use a CM216 (Apex Sensor Mount for SS Tripod). Can only one wind speed cup be replaced on a 03002-L? If so, is it user replaceable? One cup cannot be replaced at a time. The whole cup assembly would need to be replaced. The cup assembly can be replaced by the user. What is the major difference between the 034B-L and the 03002-L? The 034B-L uses a switch closure for wind speed measurement, and the 03002-L uses a low-level ac output for wind speed measurement. Both use a pulse channel on the data logger to measure wind speed.